Østerbro is a mainly residential district of Copenhagen, just north of the inner city. With its quiet cobblestone and tree lined streets, and its excellent shopping and cafe life, it makes for a good excursion from the downtown area. Along with Frederiksberg in the west, Østerbro has long been considered the posh or upper class district of Copenhagen. These days this is mainly due to the demographic of young, liberal leaning, well paid academics, which has earned Østerbro nicknames like the Latté district. But it has been a neighborhood of the upper middle class since modern Østerbro's inception, when Copenhagen expanded beyond the old fortifications in the 1850s. The district takes it name from being near the old eastern gate of the city, and translates roughly into the Eastern borough, and before the city's defences were dismantled, the area were largely dominated by grazing cows and grassy meadows, traces of which is still visible in the huge park; Fælledparken, dominating the area. When Copenhagen was finally allowed to grow out over the ramparts following a cholera epidemic, Østerbro wasn't built up as quickly and disorganized as its neighbours Nørrebro and Vestebro, and it was mainly the bourgeoisie who moved here in pompous villas in green surroundings, a heritage which has stuck to the district. Many of the mansions still stand today, and a number of them are occupied by foreign embassies. When development finally took hold at the turn of the century, it was better planned and more upscale than in the other districts, and with its big apartments and nicely crafted ornamented buildings, even the construction of a new and dirty harbour by the waterfront and new factories couldn't quite take the bourgeois aura away from the district. While Østerbro is still trailing behind Frederiksberg and its posh northern neighbour, Hellerup, in terms of wealthy residents, visitors should still expect it to be fashionable. 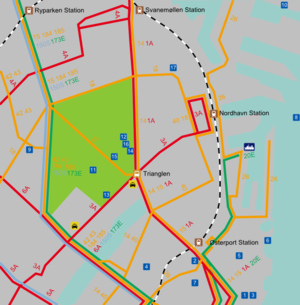 Østerbro is almost entirely located within Zone 1 of the common ticketing system that covers both the Metro, Buses, and Trains in the Copenhagen area. Østerbro is served both by the S-train suburban services that are grouped together through the central part of Copenhagen, as well as several regional lines that terminate on Østerbro's main station; Østerport. All S-Train lines except line F stop at the three S-stations on Østerbro: Østerport, Nordhavn, and Svanemøllen, while lines A and F also have stops on Ryparken station in the northern part of Østerbro. Svanemøllen and Ryparken stations are in Zone 2, so a northbound ticket might be cheaper from those. The backbone of bus transport in central Copenhagen are the A buses operated by Movia , which run every few minutes throughout the day. The S Buses are express buses that operate on longer lines, with fewer stops. Trianglen square connects five major streets on Østerbro and hosts bus stops for several lines. Trianglen can be recognized by its unusual building called the soup terrine by the locals. 1A Starts at Avedøre station in the western Copenhagen, and runs through all major areas of downtown before entering Østerbro at Esplanaden close to the Kastellet citadel. From here the next stops are at Østerport station and Trianglen before running along Østerbro's main street — Østerbrogade, to Svanemøllen station. The line terminates at Hellerup station. 3A This line does a half loop around downtown. Starting on Nordhavn station, and stopping at Trianglen, Rigshospitalet (the National hospital) and Panum university campus, before entering the Nørrebro district. 4A Begins at Svanemøllen station, and services the northern part of the district, before it crosses Lersøpark Allé to enter the Nørrebro district. It loops all around the city center, to terminate on Amager. 6A Starts in the suburb of Rødøvre west of Copenhagen, and passes the central station in downtown, before it enters Østerbro by the lakes with stops at the Rigshospitalet, the medical faculty of Copenhagen University, and the Jagtvej/Tagensvej intersection, before it enters the North-West district and continues north. 150S Starts at Nørreport station in downtown, and runs through Østerbro with stops at the Rigshospitalet, Frederik Bajers Plads, The Østerbro university campus, and Ryparken station before continuing north along the highway to Kokkedal in northern Zealand. The Arriva-operated 901 & 902 waterbuses are part of the public transportation system, and start at Nordre Toldbod, near the southern entrance of Kastellet, from where they cruise the inner habour towards downtown. Prices and tickets are the same as on other buses and trains. Large cruise ships dock at Langelinie Pier (c190-c199) or Frihavnen (Freeport) Terminal, which has multiple piers - Fortkaj (c243), Sundkaj (c245), Orientkaj (c252, c254), Levantkaj (c266), and Oceankaj (c330-c334). Oceankaj pier has been added for cruise ship use and is quite a bit further from the other piers so you may want to take a taxi or bus if berthed here. Langelinie to Orientkaj piers are both 10-15 minute walks from S-Tog commuter train stations and also accessible by public bus #26. 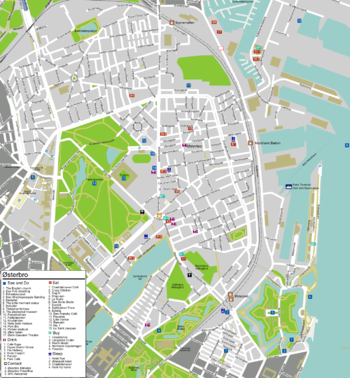 A map of the sprawling port of Copenhagen can be found here. As the attractions here are mostly grouped together, walking will most likely be sufficient transportation. But as almost everywhere in Copenhagen, Biking is really the best mode of transport. Visitors however, should be aware that the free city bike system, only covers the area closest to downtown, bordered by The Lakes, and Classensgade. 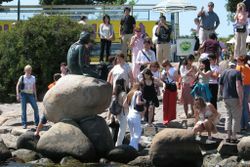 While most visitors head straight to the top attraction, the Little Mermaid statue, they are mostly left baffled on how to react by the rather unremarkable tiny statue, but all is not lost. One tip is to actually read Hans Christians Andersen's fairy tale, the statue is meant to evoke the feeling of Ariel's longing and melancholy, not impress tourists. If you haven't read the fairytale you can safely queue up with the tourists, get the ritual photo over and done with, and head for the other nearby attractions. Fiskerihavnen. Located on the eastern tip of Nordhavn (North harbour). Because of the traffic on Øresund, commercial fishing is not allowed. But the amateur fishermen at Fiskerihavnen can fish from their small fishing boats. The fishermen have tiny sheds, all different, a bit messy, but colorful. To get there you have to zig-zag past Frihavnen (Freeport, closed to the public), mountains of containers, scrap metal, interesting industries. Bus 26 goes there. There is a store that sell fishing equipment, but also ice cream and cold beers. "Krølle" sells smoked herring and salmon from his 1914 boat, "Kællingen". Fælledparken is the big park behind the football stadium, the largest in Copenhagen. There is a lake, big trees and a pavilion with a cafe which hosts concerts during the summer, the outfit Salsa Brava  also gives Salsa lessons in the park during the summer. Most of it is covered with grass, much of it marked as football fields. Go there for a game of football or another game, a picnic, or just lie in the grass. At May 1st, during the International Workers day, most of Copenhagen's population comes here in a peculiar mix of a political rally, and a seriously huge party. Due to the young and rather wealthy demographic, there are many small stores catering the local crowd with designer clothes and home décor. There are also several small galleries and antique stores. These are mainly located on the main drags: Østerbrogade, Ndr. Frihavnsgade and their side streets. On Saturdays there is an organic farmers market on Jakobs Plads (Østebrogade). Groceries can be bought in Superbest (former ISO) on Østerfælled Square which hosts a good delicatessen and a bakery. On Nordre Frihavnsgade at the east end (farther away from Trianglen) there is a branch of Netto, the cheapest supermarket chain, and one of Super Brugsen, more expensive but offering other products. Østerbro is not the place for raving nightlife, apart from the nightclub Park Café, newly opened the Office and partly Café Bopa, most places on Østerbro are low key, cozy places where you go to have a hyggelig conversation with friends, over a few snacks and beers or wine with quiet music playing in the background. Most locals head downtown for a big night out. As is the case with almost every bar in Copenhagen, expect draft beers to set you back 30-40 Kr. The options for staying at Østerbro are rather limited, as most hotels in Copenhagen are located in the downtown area — most of the surrounding neighborhoods, including Østerbro, are mainly residential. An alternative, often offering better value for money, are the numerous bed & breakfasts in private apartments. Private apartment rentals and semi-bed & breakfasts are by large the main type of accommodations on Østerbro. 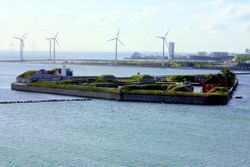 Visit Copenhagen ; the city's official tourist agency, provides several options in the district. These are often spacious and classic apartments from the 19th century, with high, decorated ceilings, and huge windows facing the street—as is the norm on Østerbro. This page was last edited on 5 March 2015, at 22:29.